Lake Superior Credit Union of Ontonagon, MI has 1, 278 members and assets of $6 million. The credit union, opened in 1959, has 3 full time employees and 2 part time employees , or 320 members per employee, compared to a national average of 430. Lake Superior Credit Union of Ontonagon, Michigan has been in service for more than 55 years. 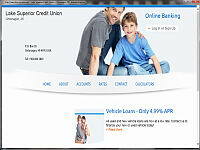 Its field of membership is a state-chartered natural person credit union. Checking services include share certificates with low minimum balance requirements. Debit cards are available. Conveniences include check cashing, low-cost wire transfers and money orders. Lake Superior CU members may also benefit from income tax preparation assistance and loans based on expected tax refund. Services to businesses and professionals include micro business loans. Members having other financial, savings, and investment needs will appreciate certificates of deposits and insurance/investment products that are offered.